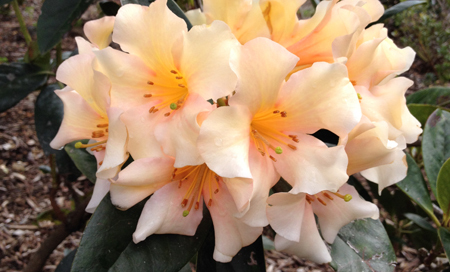 It’s our pleasure to begin the second half-century of publication of The Rhododendron with this issue featuring articles about vireya rhododendrons and their important place in the rhododendron scene in Australia. We are indebted to Lyn Craven & Frédéric Danet for reporting on the latest developments in research relevant to the botanical classification of vireyas, and again to Frédéric for his report on natural hybrids of R. herzogii. Andrew Rouse provides insight about R. citrinum, and in a separate article reports on the history of Vireyas in cultivation in Australia, a subject on which he presented at the 2010 Australian Rhododendron Society Conference. Graham Price also presented at the Conference, and we now publish his history of Australian rhododendron hybrids. We carry a report on the Conference, news about rhododendron gardens in Australia and the groups involved with them, and newly registered hybrids of Australian origin. We’re pleased to publish another in a series of very interesting article about rhododendrons in Sikkim contributed over the last three years by Hemant Badola and Bahrat Pradhan – this time a heartening report on the condition of Rhododendron maddenii populations.There’s a very well deserved tribute to Hilary O’Rourke, benefactor and Life Member of the Emu Valley Rhododendron Garden, who passed away late in 2010 – in addition to his very important part in the creation of the Garden, a very committed, enthusiastic and capable hybridizer responsible for many fine new rhododendron hybrids including plants yet to be registered.